I’m always excited when an affordable yet funky brand launches. MeMeMe Cosmetics have been around for a while but in the last 12 months, new owner Sandra Sheals has bought into the business and in doing so has completely reformulated the range looking at efficacy, moisturising abilities, range of colours and the packaging which is an essential selling point of any brand worth its salt. Sandra Sheals comments, “We acquired the MeMeMe brand last year with the idea of bridging the gap between high street and premium cosmetics. Every girl deserves to have access to premium make up with an affordable price tag. Described as an affordable boutique brand that mixes old, new, on-trend and classics, MeMeMe is infectious. It’s range begins with the Seventh Heaven Moisturising Facebase (£15) which is enriched with Shea Butter, Vitamin A ad Beta-Carotene to rejuvenate, nourish and hydrate the skin. 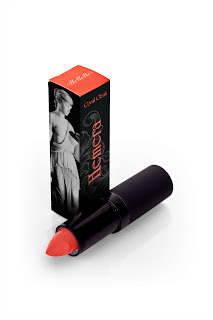 It’s rich without being greasy and delivers moisture immediately. I’ve so far used it pre make-up but it can certainly be applied post night time cleansing to deliver moisture while you sleep. The foundations, powders and concealers all have a rich, matt effect that is smooth enough on application giving good coverage while protecting against the elements. 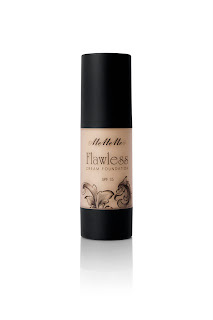 The Flawless Finish Foundation (£7.25) is rich in microspheres and light-absorbing pigments and comes in four shades from Porcelain Pure to a rich, dark Golden Glow. Ditto the tinted moisturisers. 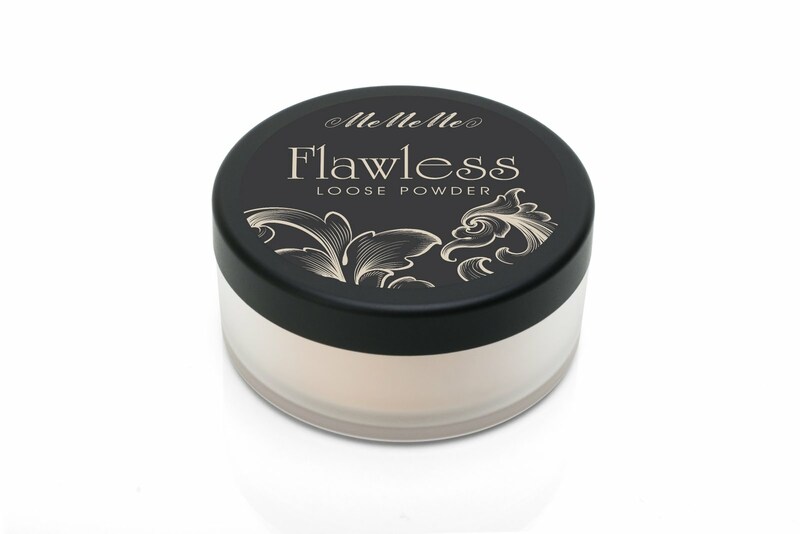 The Powder comes loose or as a compact in both translucent and natural shades enriched with light-diffusing pigments and Micra Excel to mattify your skin. Perfect for vintage aficionados. 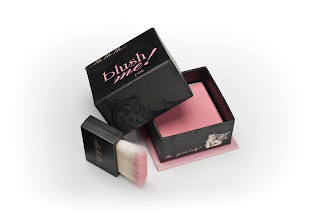 The Cheek colours of the Blush Me Blush Boxes (£8.50) are vibrant and daring while coming in a compact box complete with mirror and brush. Bronx, Coral, Pink and Rouge are the show-stoppers in this collection along with the bright luxury long wear satin lipsticks (£8.50) which are enriched with Shea Butter and Vitamin E at a fraction of the price of Tom Ford’s range. Berry Crush, Persian Pink, Hot Magenta, Tuscan Red and Pashmina Pink ooze boldness while there’s more muted shades available in the Long Stay Lips range in Innocent Fawn and Timeless Heather. For Nails and Eyes, colours range from the dramatic and electric to elegant metallics . 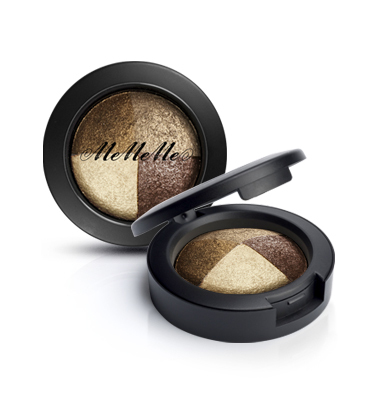 A brilliant new addition to the range is the multi-purpose Shimmer Stack – a fusion of five shimmer powders in pink zest, bronze or gold that can be used on cheeks, brows or as eye shadows. 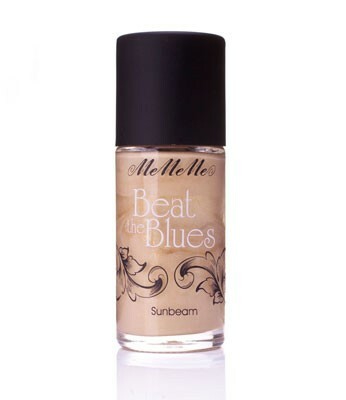 The iridescent ‘Beat the Blues’ skin illuminator (£5.25 in sunbeam or moonbeam) provides iridescence with a subtle shine and is great used as a sweep on the eyebrow as a highlighter. MeMeMe Cosmetics are available at selected branches of Superdrug and also on the MeMeMe website. Please let me know what you think of MeMeMe Cosmetics in the comment box below. Thanks. Next post: Colin McDowell Curates Masters of Style Exhibition at London’s Somerset House.